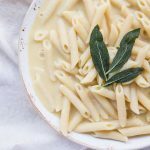 This Pumpkin Alfredo Pasta Sauce is miraculously vegan and dairy free with an option to be gluten free as well. It’s perfect as a make-ahead meal if you make a big batch and freeze a couple portions away for a quick meal. We like to think of this as our go-to family mac and cheese-type comfort food but its a completely healthy dinner. Lately, I’ve thought a lot about how much I can give credit to my kids for making me a better cook. Sure culinary school and blogging have also helped tons but my kids have truly been the ones who I think really pushed me to get to a sweet spot in cooking. Quicker recipes, healthy but easy to enjoy, less dishes, less prep, simple food made with simple ingredients… all of these qualities are ones I’d like to use to describe what I’m making in our kitchen these days. And without two little ones I don’t know if I would have gotten to this specific point in my cooking journey. This healthy pumpkin pasta sauce is the perfect example. Before having kids we often made meals that took hours to prepare, often times with unknown ingredients. I’d go to multiple grocery stores for ingredients and love every minutes of it. I was all across the board with the types of food I’d cook. 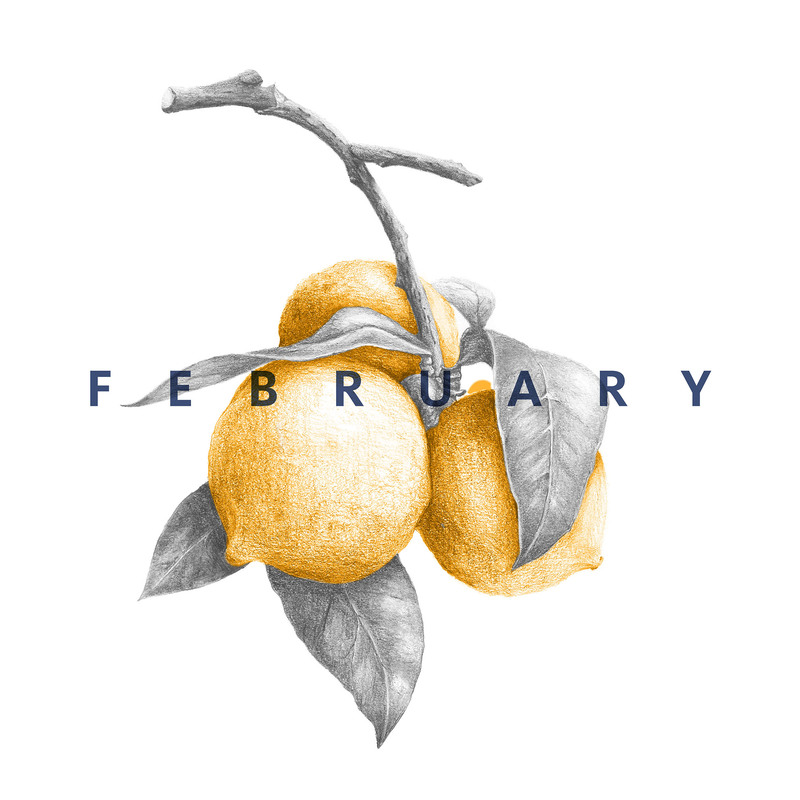 Now, with two littles I’ve been inspired to really refine my recipes, making them easier to make, enjoy, and share. 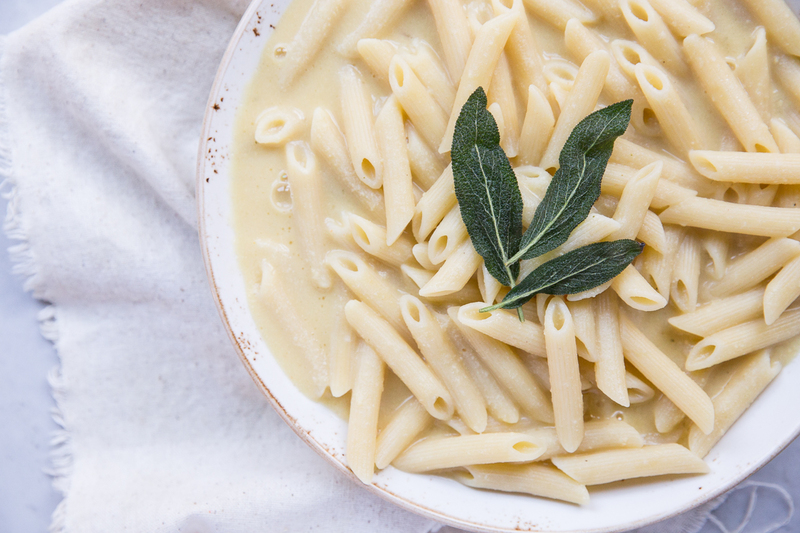 There are a few ways to make a creamy vegan Alfredo sauce. No cream, no gluten needed. Cashews are the key to making the sauce creamy. You can choose whether or not to add the pumpkin but the cashews are the staple. Add broth or water and slowly to emulsify the sauce, then add garlic and seasoning to taste. This recipe for vegan pumpkin pasta sauce is one I give my kids all the credit for. I wanted a go-to recipe that felt like comfort food but was completely healthy. 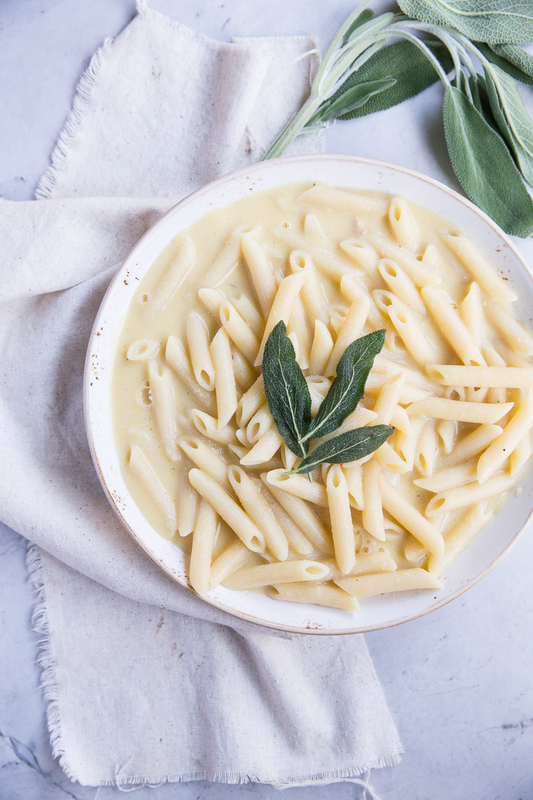 This creamy vegan alfredo makes us all feel like were enjoying spoonfuls of mac n’ cheese or pasta alfredo but we’re eating something so much more healthy! Pick out a good pumpkin for roasting (I always get pie pumpkins to cook with). Pie Pumpkins are the smaller ones and should be found labeled as such. Cut the pumpkin in half carefully with a sharp knife. Then remove all of the strings and seeds. You can always save the seeds for toasting later. They’re a good crunchy topping on top of this pasta actually! Set your oven to 350 and line a baking sheet with parchment. Brush the cut side with olive oil and prink the exterior with a fork a few times. Lay out the pumpkin, cut side down, on the baking sheet and bake for 45 min. Scoop out the insides and puree for any recipe. Here is my full recipe for Pumpkin Puree. • I’ve found this recipe makes about 3 dinners worth of alfredo pasta sauce for a family of 4 so I use one of the portions the day I make it then freeze the other 2 portions in freezer safe plastic bags. Thaw frozen sauce in the refrigerator over-night and toss with hot pasta the next day for dinner, add a small amount of water if needed as the sauce can sometimes get thick. • The pumpkin I use for this are often called pie pumpkins or sugar pumpkins at the store. They are small and round with a good ratio of ‘meat’ inside the squash. If you can weigh one, get one that is about 2.5 lbs. This will result in about 1 3/4 cups pumpkin puree. • You may also use pumpkin puree from a can for this recipe. If you do you’ll use one whole can which is a little less than 2 cups. The pumpkin from a can is often more orange in color than if you were to roast and puree the pumpkin yourself so just be aware of that and know your pasta sauce will also be more orange in color. 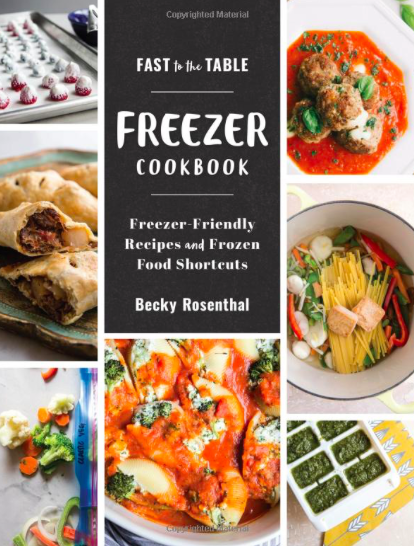 • Soaking the cashews is essential to making this recipe creamy. I usually soak mine overnight but 4 hours will also work. Soak them in enough water to cover them with about an inch. Drain and rinse before adding them to the other ingredients. 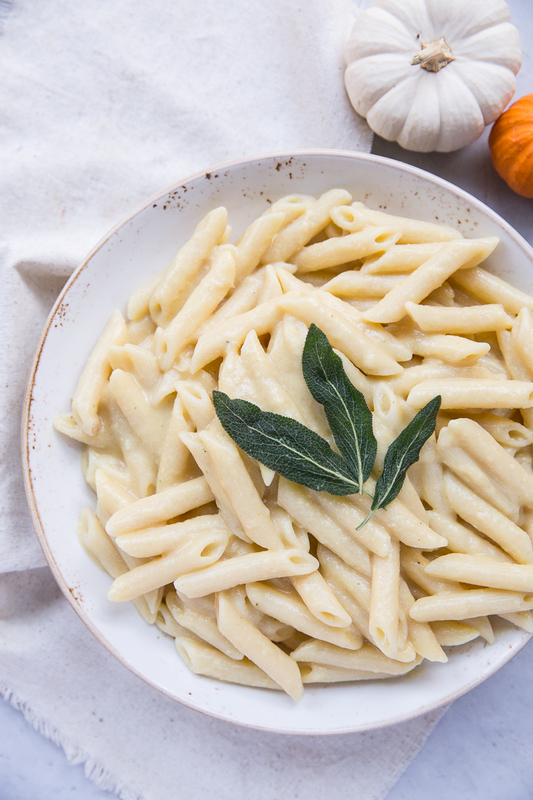 This amazingly creamy Pumpkin Alfredo Pasta Sauce is vegan and gluten free! Soak cashews in water for 4 hours or overnight. The water should be 1 inch above the cashews. Preheat oven to 350 and grease a baking sheet. Cut the pumpkin in half and remove seeds and strings (if you have a pumpkin carving tool, the scooper works great for this!). Brush the cut side of the pumpkin with olive oil Prick the skin side of the pumpkin with a fork a few times then place the pumpkin cut side down on the baking sheet and start baking. Toss the onion and garlic cloves in olive oil. 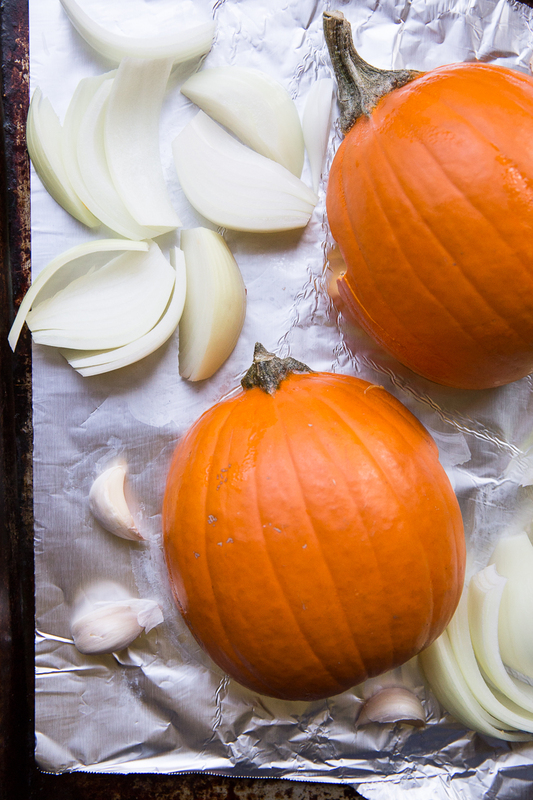 After pumpkin has been baking for 10 minutes add the onion and garlic to the sheet pan and continue to bake for another 25-35 minutes or until the pumpkin starts to deflate and is soft. In the last 10 minutes of baking, start boiling water for the pasta and cook pasta according to the directions on the bag. Set a time for its cooking time so you can work on the sauce while it's cooking. Drain and rinse the cashews. One pumpkin is done cooking and has cooled enough to handle, use a big spoon or the scoop from a pumpkin carving tools to scoop out the pumpkin from the peel. Remove the roasted garlic from its paper-like peel. In a high powered blender, combine onion, garlic, cashews, pumpkin, broth and seasonings. Puree until velvety smooth. Toss 1/3 of the sauce with hot pasta (continue heating as needed) and serve with a few fried sage leaves. I've found this makes about 3 dinners worth of alfredo pasta sauce for a family of 4 so I use one the day I make it then freeze the other 2 portions in freezer safe plastic bags. You may also use canned pureed pumpkin. Use one full can for the recipe. The pasta will be more orange in color than if you were using pureed roasted pumpkin. 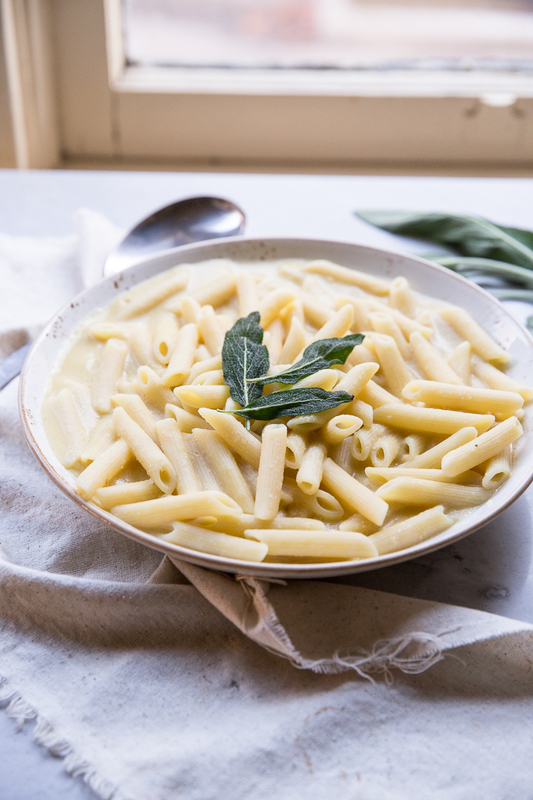 In effort to use ingredients I already had on hand, I made this recipe for lunch today (although not seasonally appropriate :-p ) This delicious and is going to be my new fall go to pumpkin recipe – just as good as mac and cheese but so much more healthy! Love your site!